The Transbay Terminal was the major bus terminal for the San Francisco Municipal Transit Agency (Muni) and three regional transit systems (AC Transit, Golden Gate Transit, and SamTrans), and Greyhound long-haul buses in the South-of- Market area of San Francisco. The terminal had long been in disrepair. A plan to reconstruct the terminal was finally approved, an EIS/EIR was certified, project funding made available, and the project is now under construction. 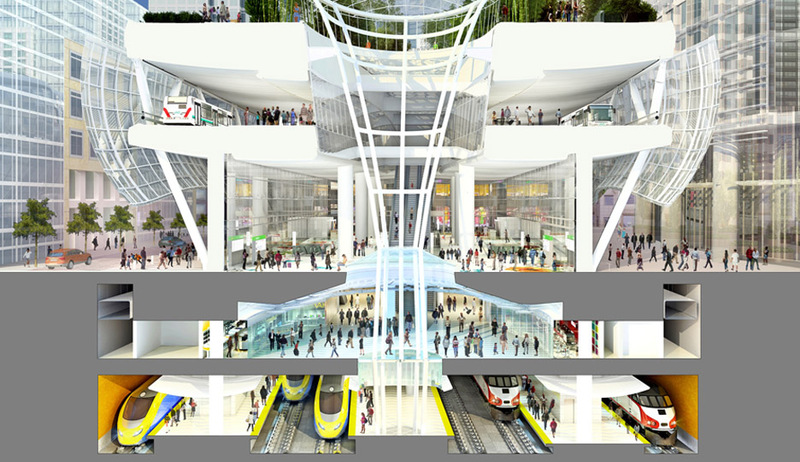 The new Transbay Transit Center complex will accommodate California High Speed Rail and Caltrain commuter rail in the underground level, and a total of 30 bus bay on the ground and upper levels. AC Transit and Greyhound will use the upper levels, and Muni, SamTrans and Golden Gate Transit buses will use the ground level. CHS Consulting Group staff have been involved in this project for over 20 years. CHS Principal Chi-Hsin Shao served as a Deputy Project Manager and a transportation Task Leader for two rounds of the Transbay Transit Center Concept Plan for the San Francisco Redevelopment Agency. He assessed access and loading needs for each transit operator, alternative terminal locations and configurations, and auto and pedestrian site circulation options. CHS is currently part of the design team, responsible for traffic signal design at seven locations: five on surface streets adjacent to the terminal, and two on the elevated bus deck leading to and from the San Francisco-Oakland Bay Bridge. At-grade intersection signals include transit signal priority (TSP). The project also includes timing and coordination plans for the intersections on the elevated bus deck in coordination with Caltrans and SFMTA. CHS is synchronizing the signals on the elevated bus deck with the surface intersection adjacent to the terminal at Harrison and Essex Streets and at the AC bus terminal gate, and Changeable Message Signs (CMS) on the bus deck.